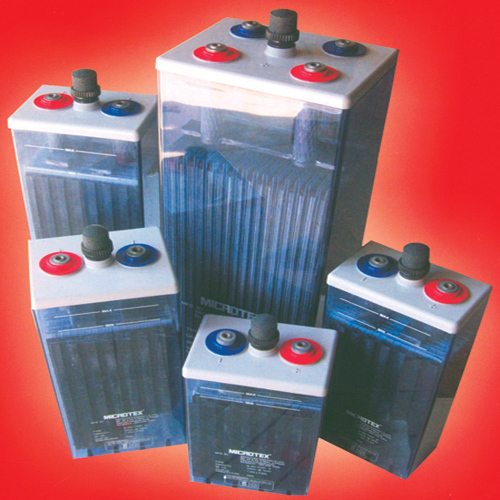 Microtex Energy offers a lead acid battery, OpzS series. The design includes a positive electrode which has tubular-plates made with high pressure (150 bar) die cast spine, corrosion resistant low antimony alloy (PbSb1.6SnSe), using superior high tenacity polyester oxide holder to hold density controlled positive active material. The negative electrode has a grid plate in low antimony alloy, with long life expander material from the best manufacturers of Europe and USA. Other characteristics include separation – low electrical resistance, no-oil, PVC microporous separator from Amersil, Luxembourg; electrolyte – sulphuric acid with a density of 1.200 kg/l as per Indian standard and 1.240 kg/l as per international practice; container – high impact, transparent SAN (styrene acrylo nitrile); lid – ABS in dark grey colour; vent plug – ceramic plugs; pole insert – M10 brass insertion; connectors – thermoplastics elastomer insulated flexible copper bolted connectors having no exposed conducting surface; etc.